Your Morgan Hill tree might drop fruit as part of a normal behavior, or it may indicate a problem. Fruit drop, or June drop, is a natural process that allows a tree to get rid of more fruit than it can support. This is common behavior for many crops. We provide the same service to our trees when we manually thin fruit. While it reduces quantity, the quality of the fruit we do harvest is much better. Fruit drop can also indicate insect pests, disease, or adverse environmental conditions. Insect feeding can weaken trees, leading to wilting, twig dieback, stunting, and early fruit drop. Black scale, mealybugs, mites and weevils are the most common culprits. Other symptoms of insect feeding include wilting and leaf damage. 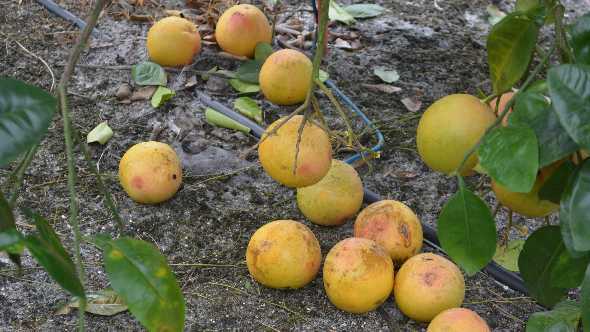 Sudden cold or extreme heat can cause fruit drop, especially in young trees. Strong winds can blow unripe fruit from your trees. The most common environmental cause of excessive fruit drop is insufficient irrigation or unbalanced soil nutrients. This is especially true for almonds and tomatoes. Fruit drop can also be caused by insufficient pollination. This can occur when there isn’t a genetically compatible tree close enough, or it can mean there are not enough pollinators in your area. You can attract more pollinators to your garden by installing a wide variety of flowering plants. You can also help the situation by avoiding the use of broad-spectrum pesticides. Sometimes, due to physical injury, disease, or infestation, heavy pruning is necessary during the fruit-bearing season. Removing large quantities of leaves can severely cut back on a tree’s ability to produce food, so fruit drop can occur. Tree training and tree pruning are best left for the dormant season. Low magnesium levels in the soil can cause fruit drop, as can high potassium or boron levels. Without a soil test from a local, reputable lab, you can’t know what your soil’s nutrient levels are. The type of soil can also have an impact on fruit drop. Sandy soils are far more prone to fruit drop than our heavy clay soil. 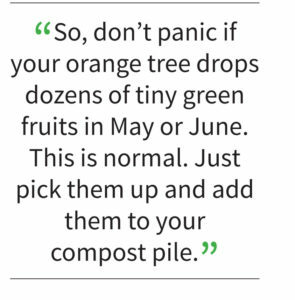 So, don’t panic if your orange tree drops dozens of tiny green fruits in May or June. This is normal. Just pick them up and add them to your compost pile. If you notice heavy insect infestations, signs of disease, chlorosis, or wilting, you will want to track down the cause and correct it for a healthy harvest later in the season. As always, remove fallen fruit and mummies as soon as they are seen, to avoid creating an environment that promotes pests and disease. 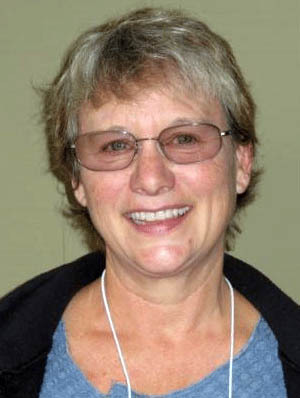 Kate Russell is a UCCE Master Gardener in Santa Clara County. For more information, visit mgsantaclara.ucanr.edu or call (408) 282-3105 between 9:30 a.m. and 12:30 p.m. Monday through Friday.